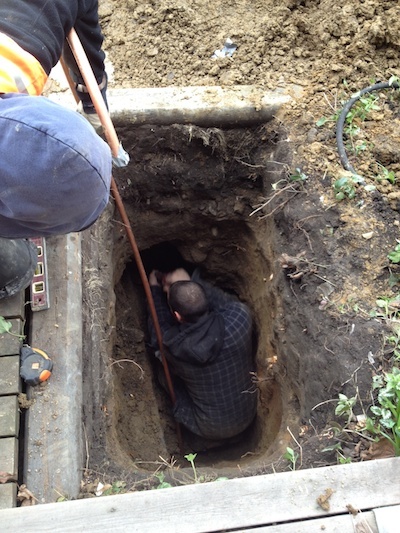 A while ago the City of Toronto came to our house to install a water meter. The guy went down into the basement, took one look at what we thought was an old but serviceable water pipe and he said nothing. Nothing. After a minute or so, this low whistle sort of escaped him, and a little wild eyed, he looked up at us and said "YOU HAVE TO GET THIS REPLACED." Joe and I kind of exchanged looks, because we’re used to this reaction. Our house was built a hundred and thirty years ago by what we feel must have been a team of drunken monkeys. They would have to be drunk monkeys, because we’re pretty sure that sober monkeys could have done a better job. 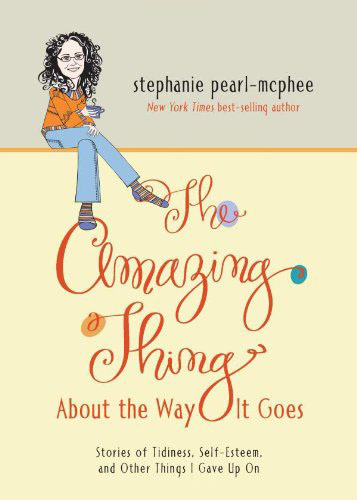 Every time we have ever gone to do anything that other people do without incident, we discover some queer new oddity. Wanna hang a picture? Guess what – our studs are at random intervals. Wanna put in a new electrical outlet? Good luck – our house was wired by Escher. Replacing the porch? We discover there’s nothing supporting our front bay. (As an aside, when we asked the carpenter what was holding up the bay if there was nothing supporting it, he shrugged and said "Force of habit?") There’s a strange little room upstairs not big enough for anything – not even a twin bed, but it has a great window and a fancy plaster job. The concrete floor in the basement doesn’t run all the way to the walls. Nobody knows why – and in the dining room we discovered that the cold air return vent – it’s not a vent. It’s a hole. A dirt hole. I could dig to the outside right through it if I had a spoon and enough time. What I’m trying to say is that most of the time now, when tradespeople come into the house to try and fix whatever we’ve found wrong now, they whistle and shake their heads and try to tell us that they’ve never seen anything like it. (That – by the way, is a lie. The team of drunken monkeys that built this house built a lot of other ones just like it here in Toronto. They were a roving band, and Joe and I are far from alone.) Joe and I usually laugh it off, and then the carpenter/electrician/plumber/whomever comes up with a creative (and always expensive) solution and we all have a good laugh about old houses. This awestruck concern is only their first reaction, so when the water guy said that we had a big problem, we just sort of stood there and waited for him to get over his shock. He didn’t. As a matter of fact, he refused to touch our water line, and suggested we not touch it either – and that maybe we didn’t want to let the cat down there either, lest she bump into it and rupture the thing. "Really?" we said, sort of surprised at his cowardice, and the dude then explains that we have original water pipes. "Lead?" I asked (thinking that a lead pipe or ten would explain some of the things my children have done over the years) and he said it wasn’t lead, that "lead would have been the upgrade" to what’s in our basement. 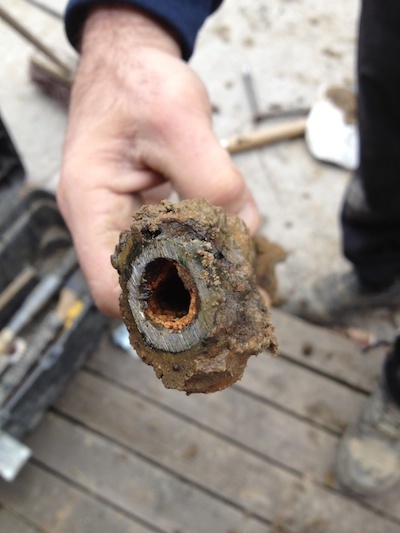 We have the galvanized pipe that the City of Toronto ran to our house when it was decided that running water was a good idea. The pipe (and what was passing for a shut off) were old and fragile in the extreme, and the guy said we had to get a new pipe before we could do anything as fancy as getting a meter. He left, saying "I’d have trouble sleeping at night if that was in my house. It could blow anytime." Fast forward a chunk of time, where Joe and I did indeed have trouble sleeping at night, worried the thing would blow and fill the basement with a lot of unstoppable water, and today we had a team of guys show up and dig a very large hole (in my garden. I’m trying not to be bitter) and take out the old pipe, and run a new one in through the old strange basement wall. They used a torpedo thing that shot the new copper pipe into the basement, and now we have a fancy new water thingie – bringing us squarely into this century. It’s disgusting. The inside is all rusted out – since it’s just old galvanized pipe. That middle part is where all that water flowed through, and it’s nothing but rust. Suddenly, I feel like I know why nobody in this family has ever been anemic. Clearly there’s no iron shortage in our diets. 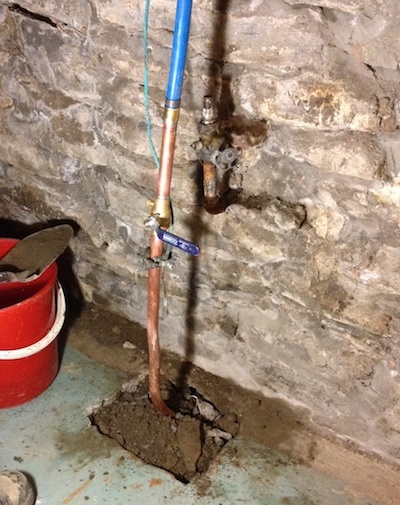 Now I have new, fancy copper pipes, and the water is flowing through something very tidy indeed – or it will be. Eventually – maybe tomorrow. Turns out that Escher and the team of drunken monkeys might have laid the city’s chunk of pipe too. There’s a little problem out front involving nine emergency city workers, heavy machinery and a lot of digging. Oddly, the city guys seem surprised. Joe and I are not. We’re thinking about showing them the wiring.